Take advantage of our instantly updated printable menus! Just like in person, many online consumers want to browse your menu before they begin to order. One of the features of our restaurant menu app is the Dynamic Printable Menu (DPM), which allows patrons to do that and more. While most companies can include a PDF of your menu on your website, only NOW provides a printable up-to-date menu that is always synchronized to your online ordering items. PDF documents must be edited and re-published every time there’s a menu change. But a DPM changes instantly when online ordering items are modified. When you raise the price of an item, or pull an item off the menu, the DPM is instantly updated to reflect those changes. Instantly Updated: Online Orders Now keeps your DPM synchronized with your online ordering menu. 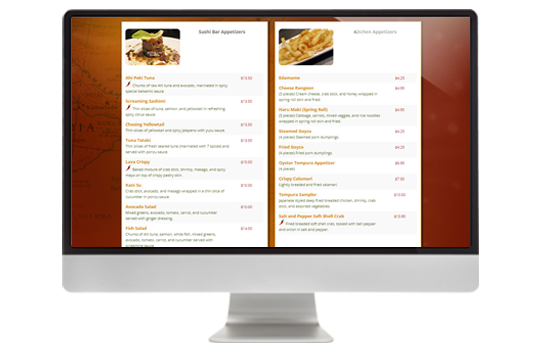 Any time you make a change to menu items or pricing, the DPM is automatically updated without any extra steps. Printable: You can print the DPM just like you would any nicely formatted PDF. Start an Order: Customers can start the online ordering process from anywhere on the DPM. This kind of interactivity saves them the hassle of having to hunt for the button that says “Order Online”. Call us today at 813-549-7010 to create your Dynamic Printable Menu today. You can also use the contact form by clicking the button below.